The first page of the March 2019 issue presents a review of the latest US hogs and pigs March report. Page 2 presents a chart and tables of the North American hog herd (Dec 2018-Jan 2019 census). Page 3 reports on the global pig price cycle. Page 4 presents the EU pig price data for March 2019 and export trade data for the first month of 2019. Page 5 presents the export sales data for the Canadians – they start 2019 on a negative note. On page 6 the USA’s exports are collated for 2018 and the annual result is seen to be a negative growth rate. On page7 Australia’s trade data are presented – imports jump and exports fall. On page 8 we see the trend for Japanese demand for imported pork may be turning down – or is it a pause before the EU-Japan FTA takes effect? Page 9 reports on a real pause for breath in South Korea’s pork imports in February 2019. Page 10 reports on the Chinese market and the likely impact of ASF as described by the recent USDA FAS report: confusion and possible catastrophe in China. Page 11 presents the news in short with short reports on VION, Russia, Rosselkhoznadzor and China, Reuters and US exports to China, ASF and hog prices in the North region of China, Anhui, Shandong, Hebei, Shanxi, and Henan. 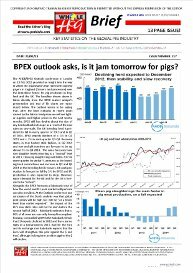 On the back page there is the price monitor for 18 countries and the chart of the week – EU pig slaughter 2016-18, and the short view of pig prices in the USA, EU and China in the next four weeks.